Round 1: The southpaw Cornelius Lock starts to use his jab. Lock lands a counter right hook to the head and then fires a combination. Escalante lands a left hook to the body. Lock counters with a left uppercut. Escalante lands body shots as round ends. Round 2: Lock lands a straight left to the body. Escalante fires a left hook to the head. Lock lands a straight left - right hook combination. Good exchanges. Escalante has a cut above his left eye. Escalante is landing hard body shots. Round 3: Escalante lands a right - left hook combination to the head. Lock fires back. Heated exchanges start to take place with both fighters landing hard shots to the body and head. Escalante drops Lock with a solid right uppercut to the body. Lock got up, but Escalante landed a series of left hooks to the head and Lock went down again. Round 4: Lock jabs and lands a right hook to the body. Escalante fires and lands a right. Lock lands a combination inside and then lands a combination to the body and head. Escalante hits hard, but Lock fires back. In the last 10 seconds, Escalante nails Lock and almost knocks him down. Round 5: A left hook to the head lands for Escalante. Lock counters with a straight left. Escalante lands an overhand right. Lock lands a vicious right hook to the head. Escalante attacks Lock's body. Escalante lands a left hook to the head. Lock is rocked again toward the end of the round. Round 6: Lock's punches appear a little slower. Escalante lands a right to the body. Lock jabs. Lock fires a right hook - left combination to the body. Escalante lands a body shot. Round 7: Escalante lands clean, crisp body shots. Lock lands a solid combination to the body and head. Lock slowed Escalante as the round ends. Round 8: Escalante presses the action. He connects with a left hook to Lock's head. Escalante lands a straight right. Lock is slowing down. Rounds 9-10: Escalante is fighting at the same pace. Lock is taking more clean shots to the head and body. His legs appear a little unsteady and wobbly. Corner could have stopped the fight in either of these rounds, but Lock showed a lot of heart and was firing back. Overall Summary: This was a terrific fight from start to finish. Both fighters showed tremendous heart throughout this hard fought bout. Cornelius Lock (18-4-1, 11 KO's) had the faster hands and landed counter right hooks when Escalante threw his left hook to the body. Lock fired many left uppercuts that landed on the inside. He landed some good head shots on Antonio Escalante (20-2, 13 KO's) too, but Escalante's pace never slowed. He kept applying pressure and wore down Lock with his body attack, especially using the left hook. Both fighters landed many clean shots, but it was Escalante who took the punches better and had slightly more power in his punch output. Get cheap boxing gloves by Everlast and Ringside. Antonio Escalante, who fights at Super Bantamweight (122lbs. 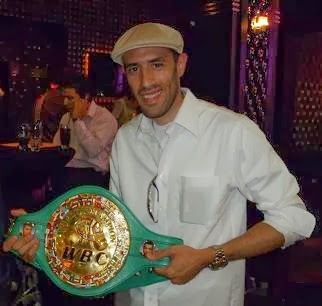 ), has won 7 straight fights against solid opposition since losing by TKO 8 to Mauricio Pastrana on January 26, 2007. Some of the notable opponents Escalante has defeated are Feider Viloria, Mike Oliver, and Gary Stark Jr. Escalante is a tough, resilient 24 year old from Mexico. Escalante's best asset is his body attack. He can wear opponents down, take a good punch and can counter the opposition efficiently, even when he does not have the edge in hand speed.